The Perks of Being a Wallflower redefines the classic American coming-of-age story. Writer/director Steven Chbosky has raised the bar on the traditional adolescent drama, with an emotionally-charged narrative infused with just enough bold strokes of joy and heartbreak to set a new benchmark for what the genre can accomplish. Based on Chbosky's own novel of the same name, the movie is about growing up in a tough and unforgiving world, yes, with its requisite lessons on overcoming obstacles. But it also touches on tragic notions of loss and grief, rarely explored in coming-of-age films with such mastery. Chbosky has said that if viewers take away one message from the film, it's that "you are not alone." This seemingly simple thought can't come at a better time, as bullying and its often devastating consequences have dominated headlines in recent months. The book's premise is deceptively straightforward. 15-year-old Charlie (Logan Lerman) keeps a diary of letters addressed to someone real or imagined. "Dear Friend," each entry begins, as he recalls his tumultuous high school days, celebratory one moment, heartbreaking the next, but always poignant and full of promise. The movie brings Charlie's writing to life, with a charming cadre of schoolmates (and the occasional peripheral adult) taking the stage as Charlie stands in the spotlight. It's an ideal structure for a narrative as free of boundaries as the promising world of the adolescent. Charlie is everyteen, we've all been there, or have we? The Perks of Being a Wallflower wanders down paths seldom seen on screen, into surprisingly shocking territory that challenges audiences to open their hearts. The indie look and feel of the film is undeniable from the start. Single-point lighting is used effectively as a plot device. Charlie's face often appears split down the center, one side brightly lit, the other in soft shadow, mirroring his conflicted soul and sense of confusion, trapped between two worlds. Light falls gently on him when he's serene, more harshly in moments of crisis. The darkness hides the secrets he deftly keeps to himself as the narrative unfolds. Audiences of all ages will be able to relate to the 80s modern rock soundtrack -- evocative songs you undoubtedly know and love, spanning generations from Boomers to today's teens. Sound design is brilliantly orchestrated with action timed perfectly to the music cues. Michael Brook's original score is appropriately minimal. Nothing needs to be underlined here in a story that has no filler or room to breathe. Not a frame is wasted on extended character development or conventional transitions in this visualization of Charlie's nonstop roller-coaster of a diary. Andrew Dunn's stunning cinematography patiently engages the viewer, eschewing the hand-held shaky cam style so prevalent in the genre. His use of slow motion dolly shots brings us, literally, into Charlie's world. The boy's fear and sense of unease is heightened by intense closeups that reveal the bittersweet emptiness in his eyes. There's a lot more going on in that youthful head than he allows those around him to see, but even he isn't aware of it. We are but voyeurs, watching, examining, trying to make sense of Charlie's vulnerability and confusion. Editor Mary Jo Markey's loving hand allows us to embrace the plot's twists and turns without skipping a beat. The pace is calm but deliberate, and it's clear that Dunn, Markey, and the rest of the production team are as devoted to Chbosky's vision as a boy experiencing his first romance. You only have one chance to get it right. Chbosky has unquestionably assembled one of the most talented young ensemble casts in recent memory. As Charlie's love interest Sam, 22-year-old Emma Watson dominates the screen with the maturity and wisdom that only a polished veteran could bring to the role. Nina Dobrev, Julia Garner, and Mae Whitman are the free-spirited girls who surround Charlie and attempt to bring him to life. Their performances shine with an authenticity that is clearly rooted in passion for the material. On the male side, Johnny Simmons portrays football jock Brad, whose enigmatic personality figures prominently in the story in ways which will be left to the viewer. Nicholas Braun and Reece Thompson are standouts in support and much-needed comic relief. As Charlie's would-be best friend Patrick, Ezra Miller is shockingly brilliant as a gay-go-lucky teen who lives life as if every day is his last. His joie de vivre is infectious and vacuums the pain out of anyone who comes near. But The Perks of Being a Wallflower primarily rests on the shoulders of Logan Lerman. As Charlie, his ability to play down to 15 (he was 19 at the time) owes itself to a physical transformation he brings to every role -- in this case, widening his eyes and keeping an expressionless face that projects puppy dog innocence. His posture, walk, and pattern of speech all serve to underscore Charlie's youthful vulnerability. However The Perks of Being a Wallflower is remembered, wherever it stands in the pantheon of coming-of-age pictures, Lerman's authentic characterization of Chbosky's semi-autobiographical protagonist should stand as one of the most iconic adolescent portrayals of our time. Some films are intensely personal, and that's as it should be. Art should move you, and you bring your own life experience to the table when considering it. The Perks of Being a Wallflower was so much more than I imagined. I expected to be moved but I had no idea where the film would take me. Whether or not you will be similarly affected is something you'll need to discover for yourself. I think you will. We all know a woman like Mavis Gary. She's the kind of girl who everyone feared in high school, who was always effortlessly beautiful, and yet she had no personality whatsoever. She would do whatever was thought to be "cool". Her loved-but-feared status meant that she probably barely registered your existence at all. We assume that this kind of woman goes on to do great things, and becomes an amazing person who would have a whole new generation of people fearing her, but that is not always the case, and that is where we meet Mavis, in Young Adult. Diablo Cody will forever be known for writing 2007's hip-dialogue laden and instantly memorable Juno, a somewhat controversial teen comedy, which served as a star vehicle for Ellen Page, ensuring that she will play rebellious teenagers well into her thirties. Diablo Cody has reunited with her Juno director, Jason Reitman, for Young Adult. I would like to mention that aside from auteur moments in Cody's writing, this is nothing at all like Juno, and that's a good thing. Young Adult is the study of a borderline psychotic personality. It's the story of Mavis Gary, a woman pushing 40, who lives alone, with her obviously neglected Pomeranian, in her disheveled condo in Minneapolis. She is a ghost writer of young adult fiction, which is ironic, considering she hasn't grown up at all since high school. She is not emotionally matured in any way, and thinks that her living in a neighboring city of her suburban hometown means that she has a life. She gets an e-mail from an old high school boyfriend who invites her to a baby-naming ceremony, or something like that. Fully intending to get him back, she blatantly ignores the fact that he is a husband and new father. In her mind, there is something not right in the universe, and she intends to fix it. We don't really know, as an audience, if we are supposed to feel empathy for Mavis, or if we should just feel pity. At several points in the film, we see Mavis laying face-down on a bed, either in her cold pigsty apartment, or her hotel room, where she appears to be dead. She's never dead, just dead drunk. Her character says to her parents at one point, "I think I might be an alcoholic", and the statement is largely ignored. Anyone who says this aloud knows damn well that they are, and the fact that her parents ignored this statement shows you what kind of family this woman came from. Mavis is definitely an alcoholic, seen repeatedly drinking heavily just to make it through the day. She may as well have been drunk in every scene. This is a study of a depressive character, but the thing that bothered me was that her parents ignored this statement, because they would obviously rather pretend that there is no issue. It's upsetting, but like I said, it shows where this woman became this way. That's good writing. This film works because the lead character is extremely well written and observed, but also because Charlize Theron knocks this one out of the park. First of all, before I get to any other facts about this character, I must say that Theron plays a drunk very well. The last thing I remember seeing her in was her infamous performance as Aileen Wournos in 2003's Monster, and it is going to sound trite, but she's playing a different kind of monster here. She is a woman whose main goal in this film is to break up a marriage. She gave so much of herself to this character, and she may as well be responsible for the film's success. I personally liked Mavis, a character who we're supposed to hate, or feel great pity for, and I give Theron most of the credit for that. With Juno, Thank You For Smoking, and Up in the Air, and now Young Adult, Jason Reitman has a fantastic track record. I have enthusiastically enjoyed each of his films thus far. It's interesting for me to think of this film as a companion piece to 2009's Up in the Air, two films about emotionally stunted individuals. George Clooney's character in Up in the Air didn't want to feel anything, and didn't want to get too close to anyone. The film ends with him not exactly changing, but moving forward in his life, ignoring factors that would have emotionally devastated the average person, and just moving forward. Meanwhile, Mavis is irrevocably stuck in the past. The best time in her life was high school, where she was popular and kind of feared, and now she is just pitied. Yet she is obsessed with making her glory days a reality again. There is nothing warm, sentimental or happy about the ending of this film, let me just say that right off the top. The film itself is dour, bleak and emotionally brutal. The performances are powerful, and the writing is excellent, yet it doesn't have the warm, happy, everything- is-better-all-of-a-sudden ending that American audiences are used to, and that's a damn good thing. Most character studies about unlikable people typically have the antihero change for the better in the end, in an ending where everything is warm, and everyone is left happy, but Mavis doesn't get off the hook that easily. While the film, in a whole, is quite depressing, its brand of black-as-night comedy is refreshing and welcome. I would call it the meanest Hollywood film this year, and that's a very good thing. It seems like once a year or so an Alzheimer's movie comes along and knocks me for a loop. I don't know what it is; I've never had any personal, real-life experience with the condition or its unfortunate sufferers, but there's ripe material for crafting warm and moving stories which invariably end with me in tears. In the last few years I have been devastated by films such as Away From Her and Barney's Version, and while Robot and Frank is certainly comparable, it's a lighter, less harrowing take on a tragic side of aging, and ultimately results in a much more enjoyable experience. Frank Langella plays Frank, a divorced senior living a life of solitude in rural New York. Between visits and video calls from his children (James Marsden and Liv Tyler) concerned about his seemingly deteriorating mental state, Frank fills his time with visits to the local library to flirt with librarian Jennifer (Susan Sarandon), and by shoplifting decorative soaps from the store occupying the former site of his favourite restaurant. He is a man of the past, and his little moments of defiance in the face of change establish his character early, so when Hunter (Marsden) arrives with a new robot caregiver, Frank is understandably offended. As much as Frank's memory regarding the day to day seems to be fading, his former 'profession' as a cat burglar remains at the front of his mind, and the robot's insistence on finding a project to keep him mentally engaged opens a window of opportunity for Frank to focus his mind and retreat back to the glory days of his youth. The planning and execution of heists sees a charming relationship forming between Frank and his robot companion, complemented by a sweet potential romance and stark moments of sadness. There's a clever subtext running through Robot and Frank as well, commenting on the loss of personality in the digital age, and the disposable nature of modern life. The more we come to rely on technology for everything, from our reading material to our aged care, the less we ourselves are practically capable of, giving rise to a generation of privileged, ironic, but purposeless people ('yuppies' as Frank calls them). What Robot and Frank highlights is not just the fragility, but also the value of a mind filled with life experience and skills. There's no substitute for the complex intelligence of our brains, and even the most sophisticated technology has more to learn from us. 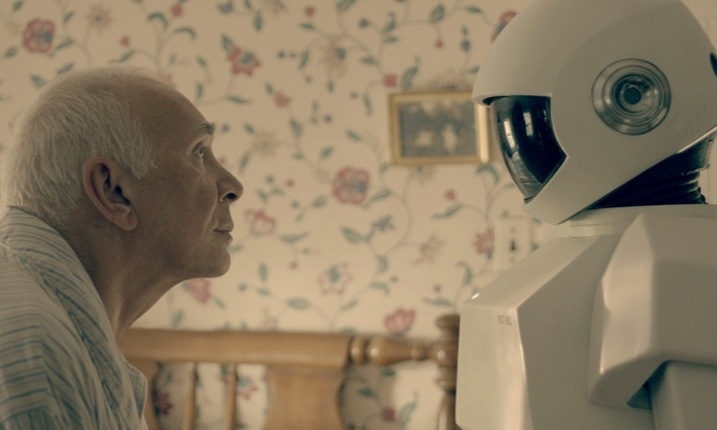 Robot and Frank feels like a film aimed at an older generation, but there is so much to enjoy for anyone who might be occasionally frustrated by our cynical modern world. There's a great balance of laughs, romance and sadness with a fun sci-fi twist, right down to the subtle Star Wars reference.